Start off with a bag of large marshmallows. 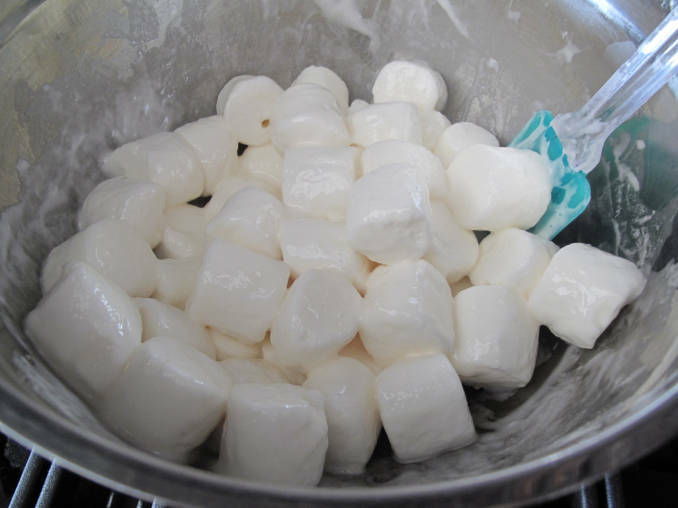 You now have two options: either melt the marshmallow mixture in the microwave in thirty second intervals, stirring so the marshmallows don’t explode (they’ll puff up), or cook them on a double boiler. 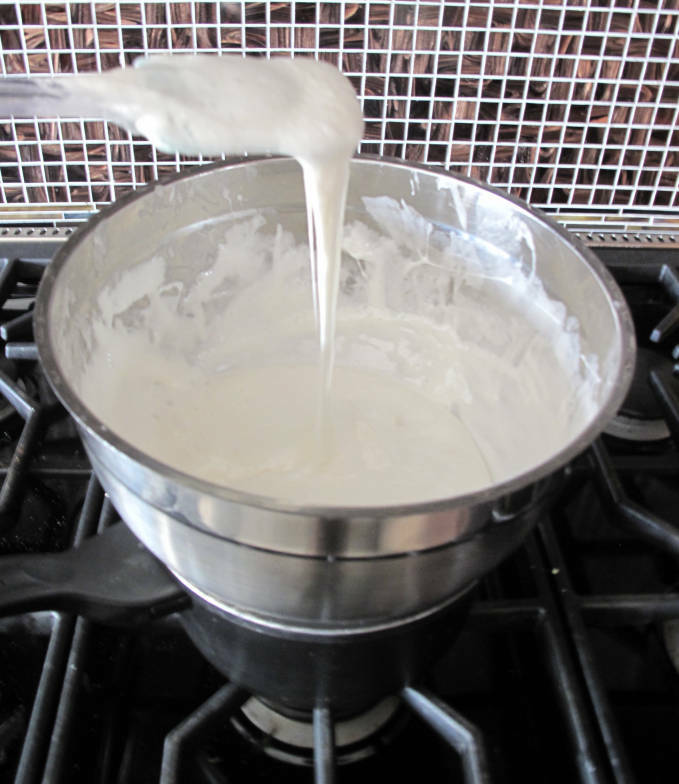 A double boiler is a pot of simmering water on a stove under a bowl. 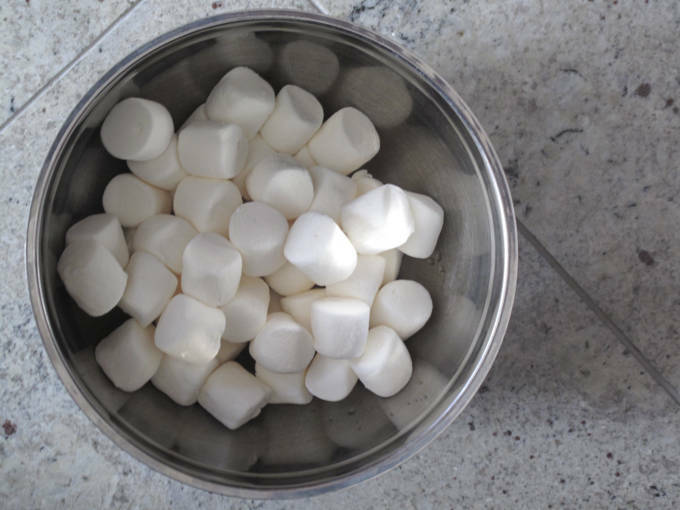 As the steam from the water hits the bowl, the marshmallows will warm up and melt. Choose whatever method is easier for you, stirring with a spoon greased with Crisco (or butter) until everything is melted and you have thick liquid-marshmallow. 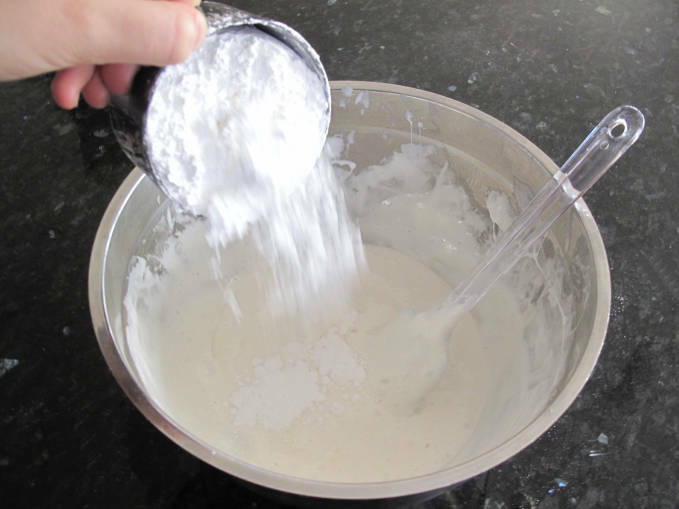 Add in three cups of powdered/icing sugar one cup at a time, stirring with the greased spoon between additions of sugar. Pour/place the fondant, with greased hands, onto a surface covered with Crisco and begin to knead until the fondant comes together. Some recipes suggest adding up to three more cups of icing sugar so that the fondant isn’t too sticky, but mine wasn’t sticky without the addition of anymore sugar. Try for yourself and you’ll know how much more sugar to add. Be careful though, since too much sugar will create a dry fondant. 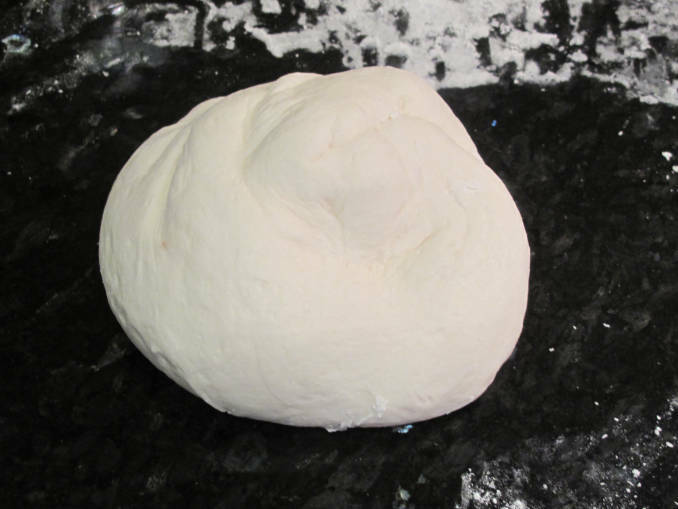 To work with the fondant cover your surface with cornstarch and roll the fondant into a thin layer. Roll out like a pie crust to cover a cake (make sure the cake has a coating of frosting underneath the fondant) or use cookie cutters to cut out shapes. Or, just use it like play-doh, and add random accessories to your cake! 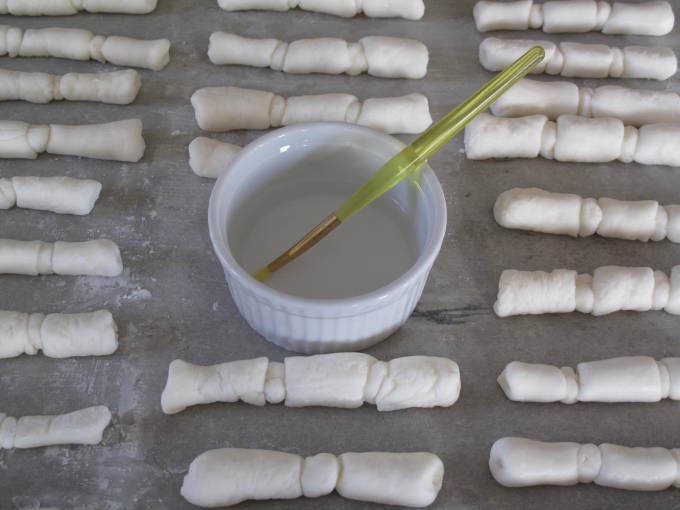 Attach fondant to fondant by brushing on a little bit of water. If you want to add colour to your fondant the preferred way is to add the colouring before adding the icing sugar since it is much harder to knead colour in than mixing it in. Add in extra food colouring since the icing sugar will lighten the colour. You can also paint colours onto the fondant after shaping it using food colouring dissolved in a little bit of alcohol (like vodka). It’s hard to describe how much fondant this recipe makes. Touch your fingertips from one hand to the fingertips of the other hand. 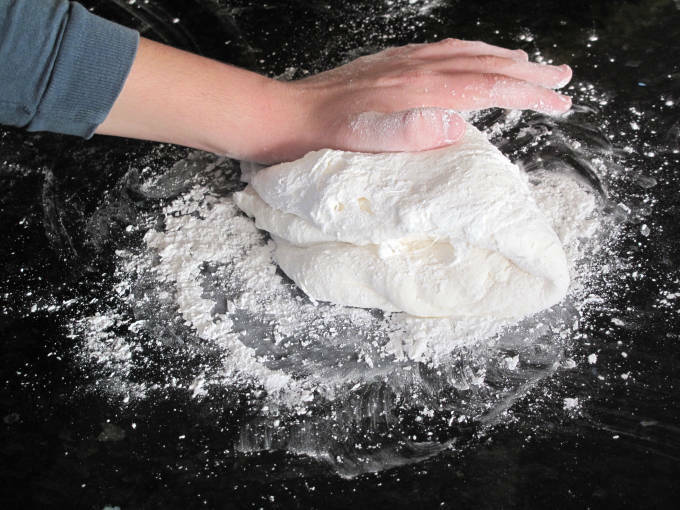 Expand your hands as far apart as you can… that’s about how much fondant you get. Look out for what I do with this fondant in an upcoming post! Check out what I used this batch of fondant for here. I have looked everywhere for a large marshmallow fondant recipe! 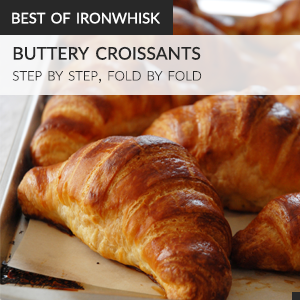 This one looks quite easy to do, but Im from South Africa, and we dont get Crisco here. What can I use as a replacement? I’ve never used any substitutes for shortening for fondant, so I can’t give you any helpful advice. After doing a Google search I saw that some people recommend coconut oil + butter. Perhaps you can try that? Lol, not to worry! I posted the question before I saw the date of the article. Thank you for the information though, I will look into that.